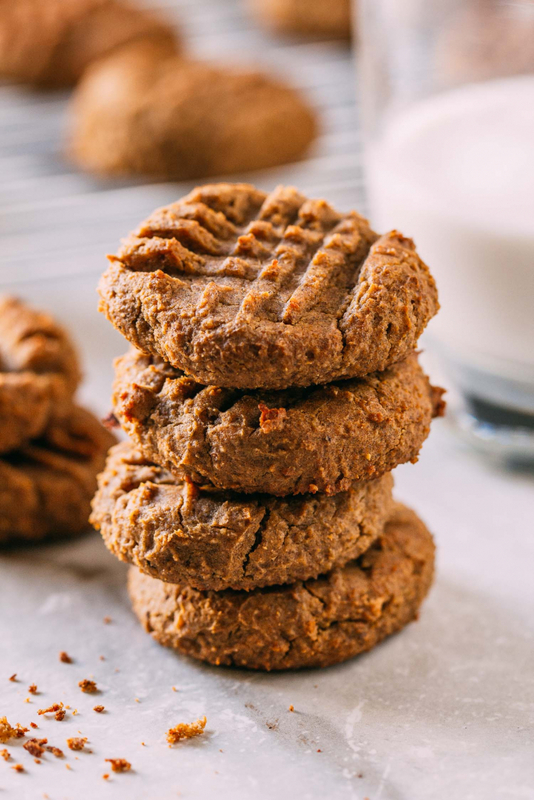 These soft and tender, plant-based 20-Minute Peanut Butter Chickpea Cookies take one bowl to make and call for absolutely no flour, making them naturally gluten-free! And if peanut allergies are an issue, this recipe bakes up nicely when you sub in your favorite seed butter for the peanut butter. Now, how cool is that? 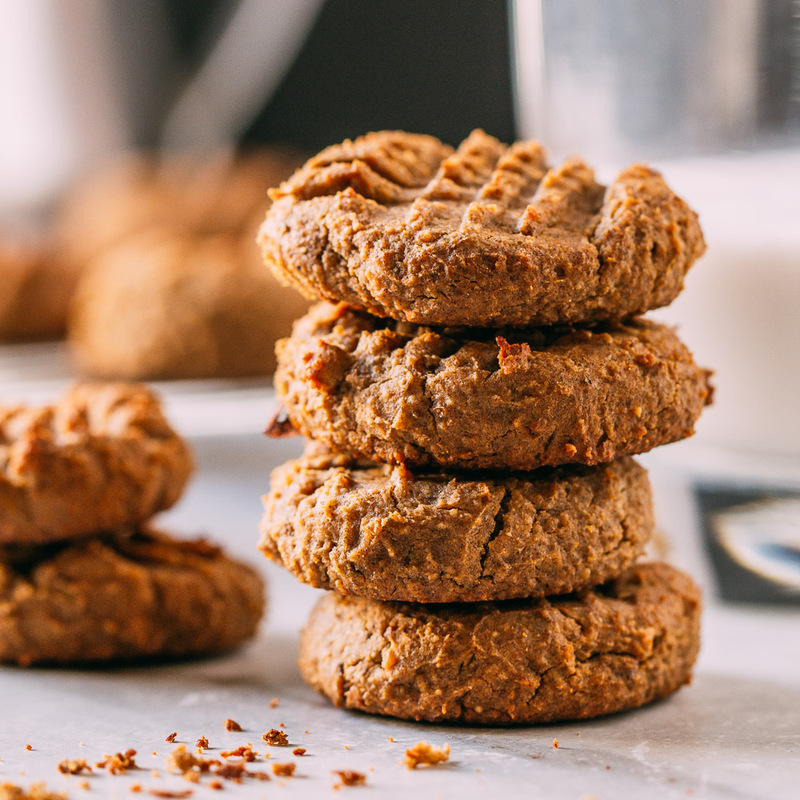 At first, we were going to name these cookies classic peanut butter cookies. We decided against that since we didn’t want to confuse or mislead Google recipe searchers. But we kid you not. Even though there are no eggs or dairy whatsoever in this recipe, at first glance, you’d swear these cookies were made from that some old sugar and fat-laden recipe many of us grew up eating. And these babies have some extra nutrients that we’ve just got to gush about for a sentence or two. First, there’s the inclusion of chickpeas which is a huge win in for about a million reasons. The first reason chickpeas are a win in that they’re a terrific source of plant-based protein and fiber. Secondly, the chickpeas add a certain creaminess and smooth mouthfeel without adding fat. And lastly, since we do not rinse the chickpeas, the little bit of “aquafaba” or bean broth adds delightful moisture. 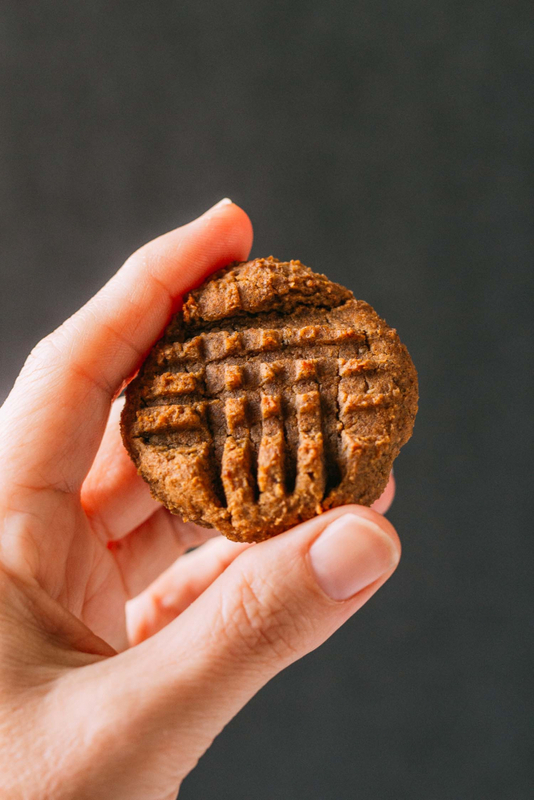 We chose to sweeten these vegan 20-Minute Peanut Butter Chickpea Cookies mostly with Medjool dates. Again, by sweetening with Medjool dates, we add nutrients as well as sweetness. Along with other vitamins and minerals, Medjool dates considerable portions of folate, calcium, magnesium, phosphorus, and potassium. How Do 20-Minute Peanut Butter Chickpea Cookies Taste? Well, for lack of a more fitting response, our first thought is to say that these cookies taste perfect. That’s right! We included the word perfect in our notes when we were testing out this recipe. Beyond that basic instinctual description, these cookies taste buttery, soft, lightly sweet, delicate, comforting, homey, and surprisingly satisfying. Did we say buttery yet? Yes, there it is, buttery! Oops, guess we did, but these are buttery without a drop of animal byproducts. The delicious buttery flavor is from the peanut butter! 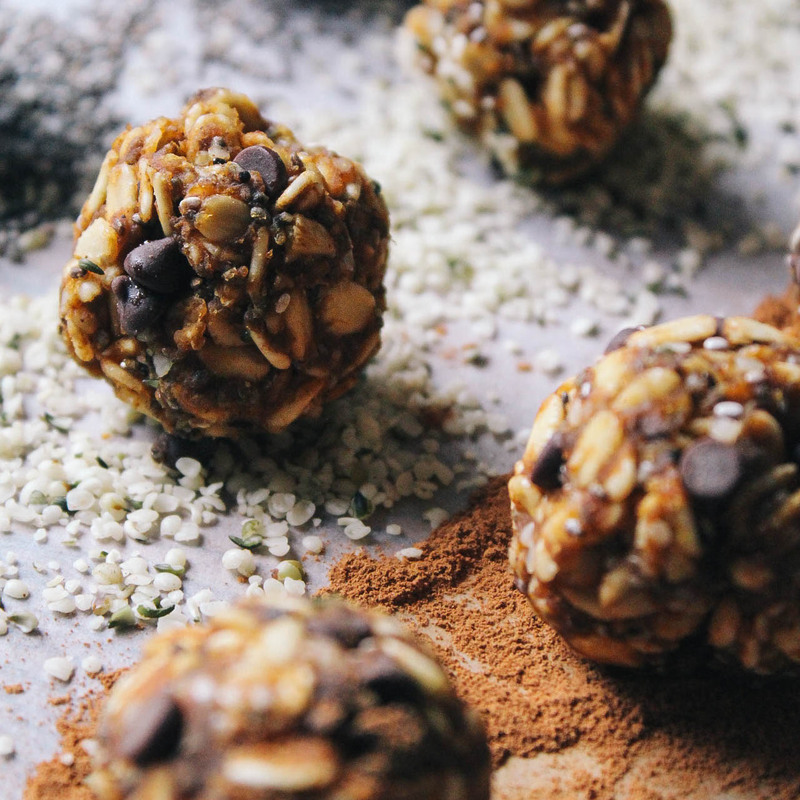 We suggest that you sit and savor a cookie or two for a sweet, healthier snack. Enjoy one with a cup of your favorite warm tea or a mug of fresh coffee. And since nearly everyone likes the taste of peanut butter and bananas together, you’ll love these with our 5-Minute Creamy Cardamom Banana Milk. When you try this recipe and fall in love with it, or if you have a question about this recipe, leave us a comment! We love to hear from you! When you share your thoughts about a recipe you’ve enjoyed, you’re helping other people who are considering trying it too! 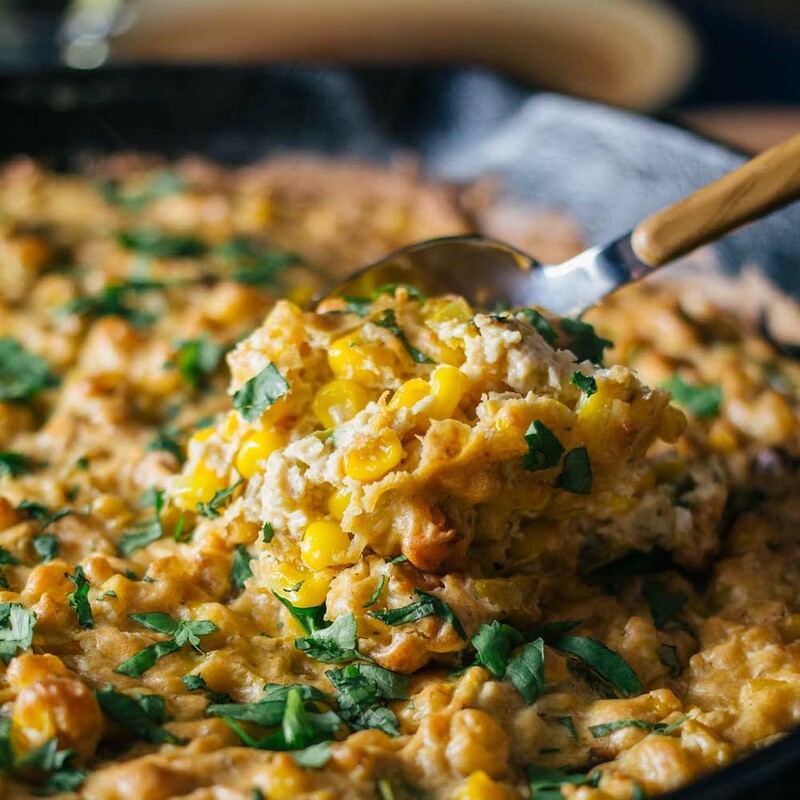 Pinning and sharing the recipe on Facebook are also terrific ways to help share the news that plant-based vegan food tastes GOOD! Don’t you love a recipe where you get to mix everything in the food processor if you like? 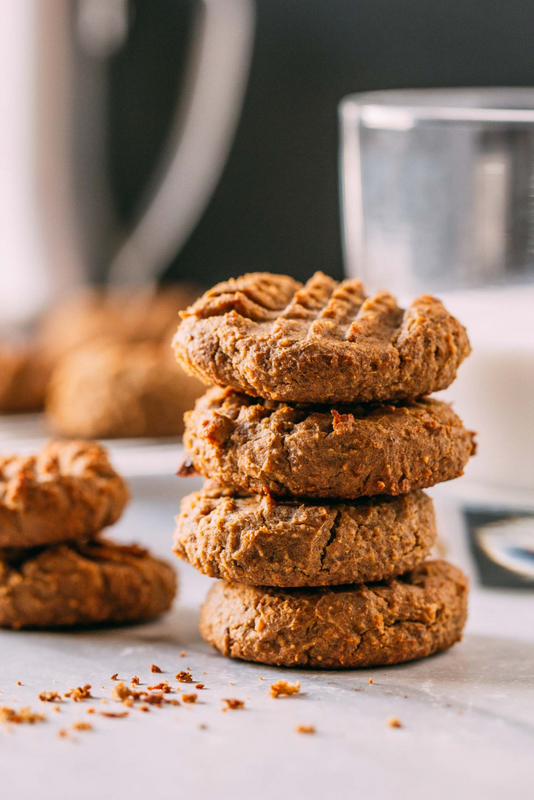 That’s how easy these 20-Minute Peanut Butter Chickpea Cookies are to make! Do everything in one-bowl or processor container. And depending on how you portion and how many batter tastings happen along the way, (uh-oh) you should get up to around 16 cookies from one batch. These cookies are a breeze to make and taste delicious paired with some creamy homemade 5-Minute Creamy Banana Cardamom Milk or a warm cup of coffee or tea. 1 – 15-ounce can or about 1 1/2 cup of freshly cooked chickpeas, drained but not rinsed - We've been happy with this organic brand of canned chickpeas/garbanzos. about six pitted Medjool dates - We used these moist dates. Begin by preheating the oven to 350º degrees Fahrenheit and lining a baking sheet with parchment paper or a nonstick silicone baking mat. Now add the drained chickpeas, peanut butter, and pitted dates to a food processor or high-speed blender and blend until smooth. We used a food processor, but you could even use a handheld potato masher if you prefer. Next, add in all of the remaining ingredients and mix until combined. The batter will be on the sticky side but don't worry, that's what you want. Drop the cookie dough by rounded tablespoon-size balls onto your prepared baking sheets. Use a damp fork to make a traditional criss-cross pattern on top of each cookie. The criss-cross pattern is pretty and allows you to create a little bit flatter, traditional cookie shape. Bake for about 12-14 minutes. After removing from the oven, allow your cookies to cool for 10 minutes on the pan. Once your homemade cookies have cooled completely, store them in a covered container at room temperature for up to a day or so. If keeping beyond a day or two, we recommend storing these cookies in either the refrigerator or freezer. Here's a tip: if your dates are on the dry side, soak them in the aquafaba (the broth from the chickpeas) a few minutes before blending them up to include in this recipe. If you happen to be like us and prefer using potassium rich Medjool dates as often as possible in the place of other sweeteners, this is a terrific deal on a bulk buy of an organic brand. When substituting listed recipe ingredients with what you might have on hand in the pantry, be prepared to expect a few visual and taste differences. Also, be aware of things such as wet and dry ingredient balance, meaning the ratio of wet to dry will need to mimic the original recipe closely for the recipe to work using the particular combination of substitutions you've opted to use. Even elements as relatively as simple as using a different variety of peanut butter than listed in the ingredients can produce notable variants in the outcome of a recipe. 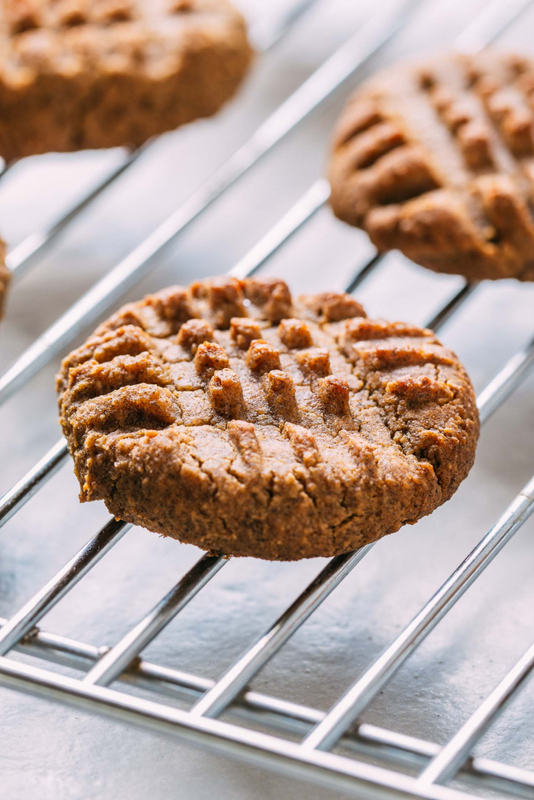 We have made this recipe using up to 1/2 cup of the pure maple syrup in the place of the dates and have had total success even though the cookie is flatter rather than ball-shaped. When using maple syrup, the cookie dough is softer, wetter, and so the shape of the baked cookie is flatter. The taste when using pure maple syrup is a little sweeter, but the cookie is very tender and tastes excellent! And although the puffiness and texture of your cookies will look understandably different than those in the photos here where we have used Medjool dates, you should be able to substitute the Medjool dates in this recipe for about 1/4 to 1/2 cup of pure maple syrup, or date syrup, with success. Another optional unrefined sweetener we have not yet tried in this recipe is molasses.